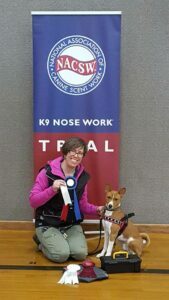 Author Andrea Stone with her Basenji, Turkish in a controversial “T” harness which he wears for nosework. Unless you’ve been living in the jungle for the last 10 years or so, you’ve heard all the controversy about harnesses, particularly the “T” type harnesses that have a strap that crosses the dog’s chest. Front-clipping harnesses in particular have come under fire in dog communities. Examples of such harnesses include the EasyWalk, Wonder Walker, and Freedom Harness. One of the first worries expressed was that such harnesses put undue pressure and restriction on the shoulder. Particularly in working and performance dogs, the shoulder is at risk of injury, therefore any additional stress placed on the shoulder should be undesirable. The concern I have heard expressed in the breeding and conformation world is that the wearing of a “T” shaped harness will affect shoulder rotation and change a dog’s conformation, given that a dog’s front assembly is only attached via soft tissue, possibly even permanently. Or barring that, change it enough to be deleterious, be it from a habitual use of the body or actual physical modification. There has been an expressed preference for “Y” shaped harnesses by many – those that essentially have a collar at the base of the neck with a strap that extends straight down over the prosternum and attaches to a strap that goes around the rib cage. Examples are the Balance Harness, Front Range Harness and Perfect Fit harness. It would seem to make sense right? A strap across the front of a dog’s shoulders would appear to be much more restrictive than a Y shape that would appear not to interfere at all. Well, what seems to be true and what actually is true are not always the same. Let’s talk about what we know. 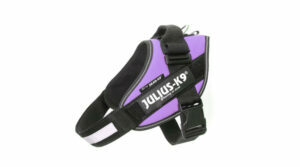 Another popular “t” style harness. Much of the concern started in 2011, when an article was published in Dog World magazine by M. Christine Zink, D.V.M., PH.D.. Again in July of 2013 concern was expressed in the Whole Dog Journal: “A sports medicine guru and canine athlete enthusiast, Dr. Zink (and others) posit that no-pull harnesses are detrimental to a dog’s structure and gait – and are especially inappropriate for canine athletes.” Results of a study by Dr.Carr and Dr.Zink were subsequently presented at ACVSMR conference, 2016. As seems to happen frequently on the Internet and in dog circles, the uproar spreads like wild fire, sometimes without any real firsthand knowledge of the information as it was presented. The first thing you, my dog loving public, need to know is that we have only seen the tip of the ice berg. There is a lot we do not know about this issue so, I beg you, take a deep breath. Early on, Dr.Zink and others recommended the use of Y type harnesses, going so far as to call them “nonrestrictive” harnesses, and to calling the T style “restrictive” harnesses. This was done based on an educated guess, not based on actual research. After all, anyone with half a brain and any knowledge of anatomy would look at the two styles and come to that very conclusion. Right? The main conclusion and recommendation coming from this study was, “Gait alterations caused by a harness may contribute to long-term repetitive strain, which could either cause or predispose dogs to injury. Thus, it is recommended that dogs not wear harnesses while training, conditioning, or competing.” The study noted that of the 5 harnesses tested, 2 affected gait significantly more than the others. One was a Y style, the other a T style. Both had wider straps and had greater surface contact with the dog’s body than the others. Further, the study recommended using the most adjustable Y type harness that had the least contact with the body. In other words, this study concluded that if you choose to use a harness, it should be an adjustable Y shape and is not to be used when your dog is exerting himself and exhibiting repetitive motion, such as jumping, etc, putting his front assembly under strain. However it is important to note that the one thing not measured in this study was actual range of motion. Based on other measured factors and appearance, it was mostly presumed that one type of harness is more restrictive of motion than the other. It is also important to note that gait alteration was only observed while the dog was actually wearing the harness. So a dog engaging in activities in which he may be prone to injury might be more predisposed if he is also wearing a harness at that time. But there was no observed alteration of gait once the harness was removed. And there is also no conclusive evidence that shows a direct link between this gait alteration and injury. More recently a preliminary study has come out that did actually measure forelimb range of motion (ROM) in dogs wearing both Y and T style harnesses. This study was conducted by M Pilar Lafuente, Laura Provis, and Emily Anne Schmalz at Department of Clinical Sciences and Services, Royal Veterinary College, Hatfield, UK and came out in November of 2018. It is important to note that this is only a preliminary study and that the real conclusion of both studies is that more study needs to be done. Wearing a T type harness with weights. First, gait alteration was observed in all dogs while wearing a harness. However the rest of the results might be counter-intuitive. The change in ROM at both gaits was significantly different between Y and T type harnesses. The Y types were measured as restricting range of motion almost twice as much as the T type! The difference between the Y style harness with and without the weights was also significantly different whereas there was not a large difference for the T style harnesses. Per this study, “The greatest restriction was from the non-restrictive harness with weights at trot, which restricted shoulder extension by 11°.” Only one brand of each style of harness was tested. All harnesses affect gait, but only while the dog is actually wearing it. There is no data to indicate that the use of a harness will have long term effects on gait, or change a dog’s gait in any way when the harness is not in use. “T style” harnesses have less effect on forelimb range of motion than “Y style”. This will be news to many! Now, personally, I have chosen not to use any form of harness on puppies and young dogs that are still developing. I also choose not to use harnesses for casual walking on a regular basis. My concern is the lack of data on long term use and the potential effects the gait restriction might have on a dog that is still growing and changing. 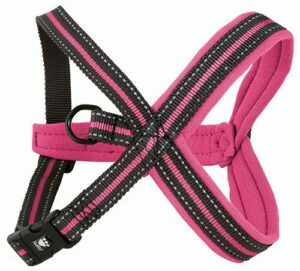 However I do use a T style harness on my mature dogs in some very specific and limited situations where risk of injury is minimal. Yes, range of motion is restricted. But here is no data to indicate use of a T style harness has long lasting or permanent effects on ROM, and in my personal opinion, any dog whose soundness would be permanently affected by such limited use was not actually sound to start with. I hope anyone who uses a harness, or is concerned about someone using a harness, will read the information available and make their own decisions. Those who have chosen to fully excise harnesses from their tool box do so for a reason, and that is respectable. But those who have chosen differently are not acting irresponsibly or failing to take their dog’s health and safety seriously. The fact is, we know very little. So let’s try not to freak out every time we see someone’s dog wearing a harness. And if you are going to freak out, make sure you have all the facts first. *Gait Cycle Time is the elapsed time between the first contacts of two consecutive footfalls of the same foot, measured in seconds. Stance Time is the time elapsed between the first contact and the last contact of one identified paw, expressed in seconds (e.g., the amount of time the dog spends with their paw on the ground). Total Pressure Index Percentage is the sum of peak pressure values recorded from each activated sensor by a paw during mat contact (e.g., how much pressure a dog is placing on each paw). Stride Length is measured on the line of progression between the heel points of two consecutive footprints of the same foot (e.g., left front foot to left front foot). Step Length is the distance between the heel point of one foot to the heel point of the contralateral foot (e.g., left front foot to the right front foot). Quality Control, Not all harnesses are created equal. Find out which style is best for your dog. 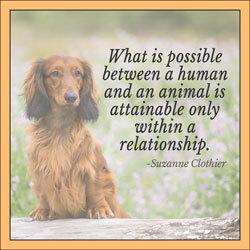 By M. Christine Zink, D.V.M., PH.D.